Masked Mom: Masked Mom's Media Monday: Joyce Carol Oates Live! 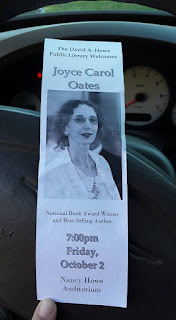 Masked Mom's Media Monday: Joyce Carol Oates Live! Last fall, when I made one of my frequent stops at the library when I noticed several signs and a bookmark announcing an upcoming library event. 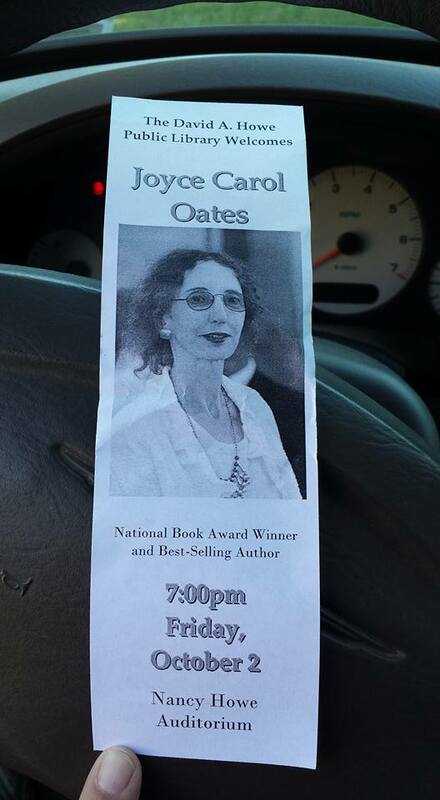 It seemed Joyce Carol Oates, the actual Joyce Carol Oates was scheduled to appear at library in our tiny, rural town. At first, I thought I must be misunderstanding something. Perhaps it was a lecture about the works of Joyce Carol Oates, but it seemed virtually impossible to me that Joyce Carol Oates, National Book Award Winner and Bestselling Author, could possibly be appearing here in our town of 6000 people in our rural county nestled up against the Pennsylvania border. But, after reading the bookmark announcement repeatedly, I had to accept it was true and then the giddiness began in earnest. From my Facebook post the day I found out about this event. I was so excited, I couldn't even wait to get in the house to post how excited I was. I don't remember the first Joyce Carol Oates book I read, don't remember when I first heard her name. I know that I already knew who she was by the time We Were The Mulvaneys was chosen by Oprah as a Book Club pick. I may even have read that particular title before it was chosen. I have not read all of her work--she is famously prolific so I may not have even read a complete list of her work. There have been a few books of hers that I started and was unable to finish, but the ones of hers that I loved are books I count among my very favorites. Not only does she write an almost supernatural amount, she writes in an impressive variety of styles and on varied subjects. For as long as I have been reading Oates's books, I have been studying her author photos. They were often the same photo from one book to the next or one of two photos that seemed to have been taken around the same time. She looked delicate in these photos, almost waifish, reserved, perhaps aloof. She looked as if she belonged to another century altogether, I thought. Judging from these photos, it was easier for me to imagine her locked in an attic room scribbling away in secrecy than to imagine her as the literary force she actually is. On the night of her appearance at the library, the woman who took the stage was easily recognizable as the woman from the photos, though she was noticeably older. When she first began to speak, there were hesitations and pauses and her voice was at first so quiet she was difficult to hear even with the microphone. But as she warmed to her subject, began reading from her work, she appeared to become someone else altogether. She told stories about her family, her home in a small western New York town not unlike ours. She even jokingly compared Donald Trump to a strutting, but mostly useless rooster in her parents' farmyard. Later, when Daughter-Only and I were in line to have books signed, I watched as she transformed once again. She spoke quietly to the others in line and posed for requested photos with an almost pained expression on her face. Up close, she looked exhausted and overwhelmed. It was nearly 9 p.m. by this point and she had also given a talk earlier in the day at a nearby college. When it was my turn, she asked if I wanted personalized inscriptions in the two books I presented. I declined because I did want to impose. I said, "I'm sure it's been a very long day." She smiled slightly and said that it hadn't been so bad. She said the previous day had been worse, that she had been stranded in some airport or another for nearly five hours. She signed my books and I thanked her and moved on for the ten or fifteen others who were still in line. Then, it seemed, she was to be quietly whisked out of the library, but someone began applauding as she tried to make her exit and the ovation swelled. She lifted her hand in an almost apologetic gesture of farewell. I suppose it is rare to be in the presence of greatness, of the literary or any other variety. Sometimes greatness up close turns out to be surprisingly ordinary, which in some cases can make greatness seem all the more extraordinary. Masked Mom's One-Word Review: Awestruck. 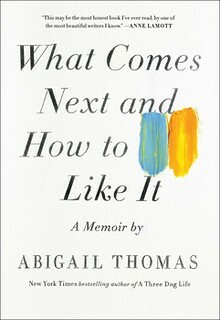 I had never heard of her until the book club I belong to announced it's books. We are reading Blonde in June. I ordered it from B&N. Looking forward to reading her. I've heard the name, but I have not read any of her books. I just went to Wikipedia and read about her. I'm always looking for a good read. Thanks!